• Fir tree mounts are equipped with a friction tab that will hold the tie in the mount, allowing them to be preassembled prior to installation. • Fir Tree design provides low extraction and high extraction force. • Fir tree mounts are equipped with a friction tab that will hold the tie in the mount, allowing them to be preassembled prior to installation. • Fir Tree design provides low extraction and high extraction force. 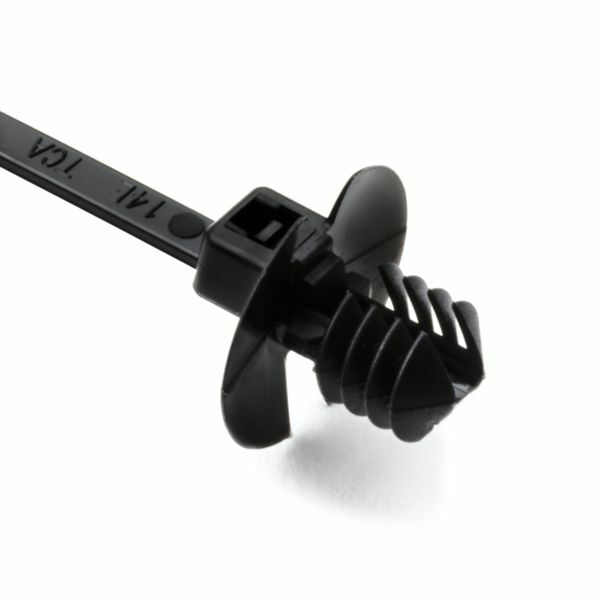 Fir tree mounts with ties cables provide a secure grip in mounting holes and protect against dirt and other impurities. This is sold as an assembly with the cable tie.